Not quite three months of peaceful training on the river and here we are for Eights Week! With M3 successfully rowing on last Friday, four crews in maroon (well… maybe fuchsia, depending on whether you ordered the latest round of kit with that colour accident) are aiming to bump up. With a motley crew of some of the guys fancying a summer paddle and veterans of “the tree” the Women’s 2nd Torpid (nowadays colloquially known on the river as “doing a Merton”) braved both rowing on, clocking in the last qualifying time of the day which both qualified them but saddled them with the misfortune of inheriting last year’s bungline. Now squaring off against St Hilda’s M2 who qualified 25 seconds ahead of them, fight was valiant, but unfortunately short and the division headship had to be handed over. Though St Hilda’s failing to bump up as sandwich boat allows a chance for revenge tomorrow. 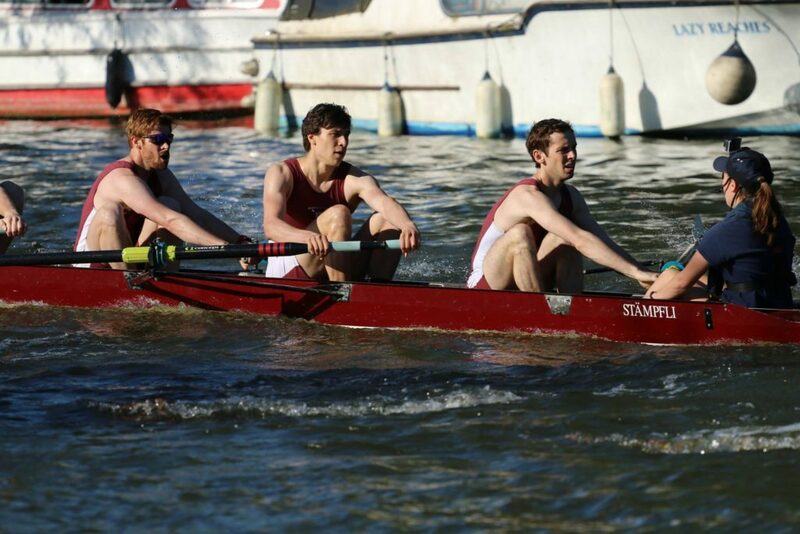 With a strong start from a difficult bungline M2 had closed hard and fast on their Brasenose counterpart. At Salter’s a mere quarter length separated the Merton boat from the Brasenose stern which quickly became just a canvas even decreasing to a foot or two as they shot Donnington Bridge. Unfortunately, the last few centimetres are the hardest to close and with crews nearly evenly match, the race rhythm and composure showed tenacity and the hard training, but left both crews returning to the same bunglines tomorrow. Hopefully the row will be shorter and will come to a sudden, bumpy, end. Looking sharp and composed during the warm up M1 was looking to clear Exeter out of the way in order to be able to bump up into the next division. A concerted effort and strong and solid row, closing in onto Exeter showed a crew set up well for the bump with good coxing line at difficult corners, but Exeter, for today, escaped the Merton bow. With Exeter not being able to capitalise on their row over, the battle for division headship and the chance to move up is back on tomorrow. In their freshly refurbished and bright-purple Joe Virden, the Women’s 1st Eight challenged the Magdalen and Linacre women in WDiv2. Unfortunately, the strong graduate crew from Linacre proved the better one of the day W1 will have to look for their bungline one further down tomorrow. Round up of day two of Summer Eights: a rather mixed day for Mertonians, but some good rowing nonetheless. The weather continues to hold beautifully. Despite a variation in line-up due to injury, M3 put in good showing in the first division of the day. After a great start and a good settle the crew found a strong rhythm as they pushed upstream under Donnington Bridge. Balliol M4 – a blades-tapped Schools Eight – unfortunately made an early appearance alongside. Despite concession, the large speed differential led to Balliol running over the Merton stern, lodging themselves firmly in the rudder yoke and spinning M3 into the bank. It wasn’t pretty. The tally on the Merton side is a bent rudder stem and yoke and a shared-off bow ball. Presumably the Balliol bow will have need for a few patches as well. With strong crew improvements, despite the downward slope on the bumps charts, the crew is looking forward to the remainder of the week. Today St Hilda’s men took revenge for last year when the 2nd VIII had inflicted the first bump on them since they started fielding men’s crews. A kerfuffle with crews in front, both Brasenose M2 and Osler House had different interpretations of “clearing the racing line” necessitated some hard rudder whereas St Hilda’s could make use of a slightly straighter gaining hard. Unfortunately, an appeal led to no avail and M2 will be starting from the unfavourable bungline 12 tomorrow. The men’s 1st VIII had not only one, but two chances to showcase them putting the hard training of the last months to good use. After a strong start and closing hard onto Exeter, the gap was merely half a length at the entrance of the Gut, having closed it to a canvas by the time both crews raced past Longbridges further upstream along Green Bank. While it nearly looked like to be a replay of yesterday, Exeter had to bow to a strong row from the men up Green Bank. Oriel M2 did not stand a chance and Merton has now returned to MDiv2 after nearly a decade of absence. In true Merton spirit with the boats improving even during the race weeks, the women’s 1st VIII had made it to Top Gut until they had to concede to LMH despite rowing and chunky rhythm. Tomorrow they will have Exeter on their tails who will try and avenge their men being taken down by Merton M1 today. On the third day fortunately for one boat, unfortunately for all others, the trends of the earlier days were continued. A bonus for all boats was the continued amazing weather and the banks being more and more filled with spectators cheering on the racing crews. Our fun mixed boat is unfortunately placed with several schools Eights around them. As such they had to concede just after Donnington Bridge to a powerful St Catz pushing them to start a bungline further down for the last races. One of those days when planned race (quick start, settle to pace, pushing off Donnington Bridge, speeding up green Bank and catching St Hilda’s at Boathouse Island) was somewhat different to the reality. St Hilda’s bumped out quickly on a slow mixed Osler House crew ahead and Lincoln raced up from behind. A bow on stern bump as M2 was the result. Clearing the race line under full power, the Osler House cox was fearing another bump, but the well-trained crew’s responsiveness prevented that. The next race should be the best one of the week. A slightly rocky start did not stop the women from gaining 1/4 length on LMH quickly whose start seemed to be less determined than yesterday. As the crews settled unfortunately Exeter W1 were out for revenge for their men being bumped by M1 yesterday and charged up the bunglines. A valiant push held them at bay for some lengths but the bump was indisputable right before shooting under Donnington Bridge. The last races are now to stave off the dreaded soup implements. A quick start a high-paced but short race: St Anne’s had nothing to show and M1’s powerful rhythm and speed and had to concede in the Gut. The final day of Eights week was a very eventful one, fortunately none of the Merton crews were involved in any of the (multitude of) crashes which happened. We had two full boat evacuations, even MDiv1 had to be klaxoned due to a severe crash in the Gut. Luckily the Magdalen cox is alright, though their brand new Empacher is less so. Both Headship crews rowed over meaning Christ Church are holding it for the men and Wadham for the women. As every day, our motley crew of M3 paddled to the bunglines. Having been relegated three times so far in the bungline fight, the plan was to not continue last year’s trajectory and collect spoons. Unfortunately, Keble M4 was chasing and since their two coaches, both ex-Oriel M1 rowers one of whom rowed Isis, decided to sub into the crew our valiant M3 had no chance. At least Keble spend some money of their rather deep pockets on a set of wooden spoons which were presented to our crew. A rather surprising reversal of fortune brought M2 significantly back into the plus today by achieving a double over bump. With Lincoln M2 ahead who had a very likely bump on Osler House, the expectation was to fight for the row-over. The chasing Regent’s Park already having rowed over as head of MDiv5 were now pursuing both their blades and a promotion to MDiv4. They had closed to overlap by Donnington Bridge. A series of pushes, only few feet of manoeuvring space through the Gut, M2 never had more than a canvas of breathing room from the chasing Regent’s who gained overlap again at Longbridges. A forced early crossing due to bumped-out crew having wrongly cleared to Green Bank, the final move was made at Univ raft. The chase was broken, clear water opened up and M2 powered to the line. A row to their true potential and credit to their training. Much to everyone’s surprise, no successful row-over was announced on the tannoy, but a bump on Brasenose M2 instead. While Brasenose (having started on bungline 8) claims to have been wedged in by crews bumping out ahead of them and promptly appealed, their attempt to disguise their lack of coxing skills by blaming others was discovered and the bump upheld, thus creating a double over-bump in favour of M2 leaving them net +3 for Eights Week! A great start allowed W1 to reel LMH slightly back in with the Wolfpack of Wolfson W2, the highest-placed ladies’ 2nd VIII, hot on their heels. The brief hopes of not repeating ourselves were squashed despite a good fight. The bump came just before Donnington Bridge. Despite another addition to W1’s collection of cutlery particularly suitable for the soup course, the week ended on a positive note as the crew put in a strong effort and plans for resurgence after the long vac with strong autumn and winter training are already afoot. In a fantastic continuation of the previous days, M1 bumped up and decisively so: Pembroke M2 was caught under Donnigton Bridge. A very good performance reeled in Pembroke throughout the bunglines and this was an excellent end to Summer Eights. 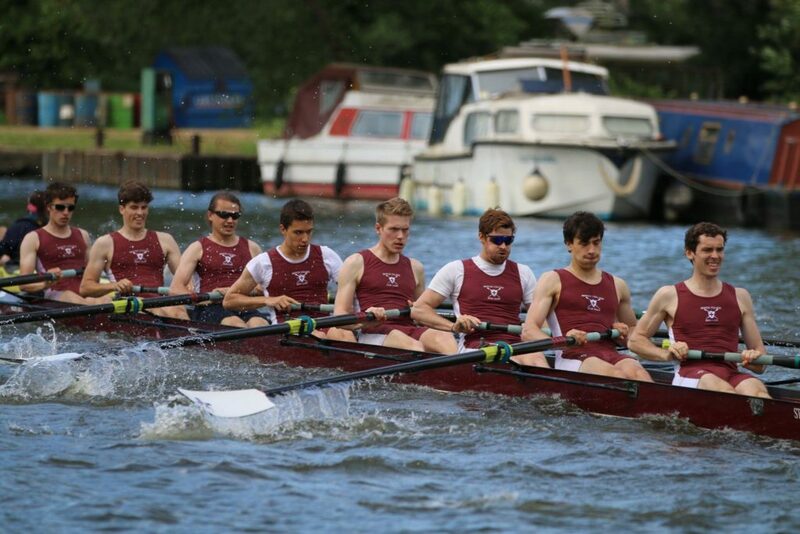 Not only did the crew bump up a division, but by sending Pembroke to the bottom of the division has now surpassed the highest-placed 2nd VIII on the river as well as becoming the most senior boat in the club. The only frustration of the week was the row-over on Wednesday, meaning that the crew did not repeat last year’s success of winning blades.